KANUTI HOT SPRINGS — After a few hours of skiing through deep snow, Forest Wagner and I smelled a tuna sandwich. We knew we were closing in on warm pools of water. From the frozen Kanuti River, we moved along an open stream up toward Kanuti Hot Springs, one of more than 100 hot springs in Alaska. Except for the extreme northwest portion of the state, hot springs exist from Attu in the Aleutians to the northwest Brooks Range to as far south as you can get in Southeast. The majority are on or near volcanoes, with very hot water bubbling or steaming up from deep below, where Earth’s great crustal plates are grinding past one another. In non-volcanic areas of Alaska like the Interior, deep warm rocks that were once magma are the heat source. Water that falls as snow and rain percolates down until it reaches those hot rocks. Superheated, that water rises, snaking upward through fractures in the ground and pooling on the surface as steaming water. On a white, windy spring day that felt like midwinter, Forest and I skied into a clearing and found Kanuti Hot Springs, about 13 miles from where the Dalton Highway crosses the Kanuti River. Kanuti is in a field of brown grass surrounded by a forest covered with two feet of snow. The thawed acre featured several pools of hot water. We pulled our mittens off and stuck our bare hands in the largest one. We were in luck: the temperature was about 110 degrees Fahrenheit, not too hot, not too cold. Using our ski-pole baskets as strainers, Forest and I scooped out floating algae and greenish blobs of cyanobacteria. These heat-loving microorganisms give hot springs their splashes of color, from white in water close to the boiling point to yellows and oranges in cooler pools. Living things floating in water are not the only exotic organisms here, 15 miles south of the Arctic Circle. In the field around us grew a grassy fern known as fowl mannagrass. It does not exist in valleys on either side of Kanuti Hot Springs. It only grows here and at one other hot spring in Alaska. Somehow, some way, seeds of the plant found their way to this heated meadow behind Caribou Mountain. American dippers, roundish birds that feed underwater year-round, live near many hot springs and the unfrozen creeks the warm water enables. We saw none at Kanuti, but a pair has nested behind a waterfall emerging from Melozi Hot Springs near Ruby. The trees surrounding the Kanuti clearing are typical of the boreal forest, but Pilgrim Springs on the Seward Peninsula is home to spruce and pine trees, probably planted by someone during that place’s long occupation. Balsam poplar trees also grow there. Pilgrim Springs was home to a pair of nesting great horned owls when I visited in spring 2015. Surrounded by an ocean of tundra, the forest-dwelling birds might be living their entire lives on that island of trees. In places like Pilgrim, Manley and Circle hot springs, people have used the warm water to heat lodges and greenhouses and have planted large fields of vegetables in the microclimate of warm soil. The operators of Chena Hot Springs, connected by road to Fairbanks, are generating their own electricity using the temperature difference between hot and cold water. 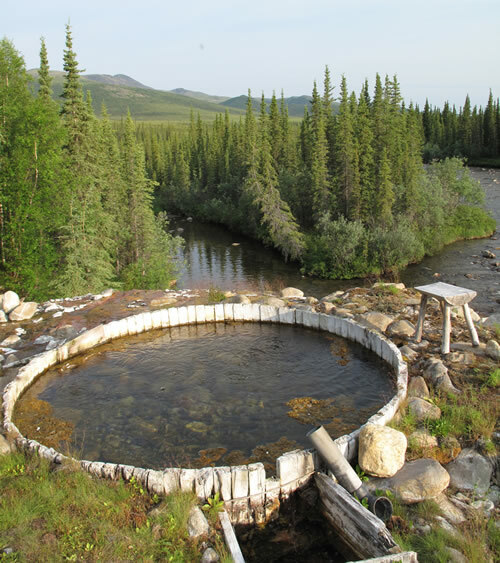 For many years, scientists and engineers have studied the potential of Alaska hot springs to provide heat and power for communities dependent on diesel fuel. Very few of the projects have progressed beyond the initial stages. Why? That reason was obvious as Forest and I soaked in Kanuti Hot Springs, hearing only the wind whistle through birch branches. While I have visited a dozen hot springs in Alaska, I have driven to just three. Most of them are like Kanuti — in windy places near lonely bends of a river, far from anywhere Alaskans call home.